Yanmen Pass, or Xixing (西陉Xīxíng /sshee-jing/) Pass, is about 20 kilometers north of Dai County Town, Xinzhou Prefecture, Shanxi ProvinceI. It was one of the important Three Passes (along with Ningwu Pass and Pian Pass). Yanmen Pass is on the strategic passage south of Guangwu, Shanyin County. Wild Goose Gate was so called because wild geese were seen flying around the pass every year. During the Warring States Period (475–221 BC), Yanmen Shire was set up by the emperor of the Zhao State. In the Tang Dynasty (618–907) a fort was set up, called Xixing Pass or Yanmen Pass. Its site was on Yanmen Mountain to the west of the Ming Yanmen Pass. In 1374, Lu Ting, a famous general from the Ming Dynasty, rebuilt the fort at the current site. Yanmen Pass is about one kilometer long, and the height of its wall is about six meters. The fortress, with three gates, is filled with stones and faced with bricks. On the eastern gate is a tower called Yan Tower. 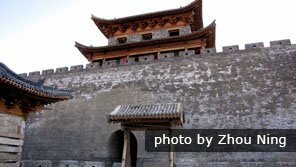 It is also called Tian Xian (天险 Tiānxiǎn /tyen-sshyen/) which means &apos;an impregnable fortress&apos;. On the western gate is Yang Liulang (杨六郎 Yáng Liù Láng /yang lyoh lung/)Temple. It is called Di Li, (地利 Dì Lì /dee lee/) which means &apos;to choose the proper location for a battle&apos;. The northern gate of the Yanmen Pass. On the northern gate there is no tower. At the head of the gate there is a stone tablet with the three Chinese characters of Yanmenguan. On each side of the gate there is a couplet carved in the bricks. There are barracks at the north of the pass, and Jingbian Temple is to their east. Inside the fortress there are a couple of stone lions, a stone flag pole, and a stone tablet. On the tablet there is a record of Li Mu’s great contribution, a famous Zhao general of Zhao who led his army undefeated against the Mongols. To the southeast of the fort, there is a training ground for soldiers. The two tourist areas of Yanmen Pass are Ancient Yanmen Pass and Ming Dynasty Yanmen Pass. 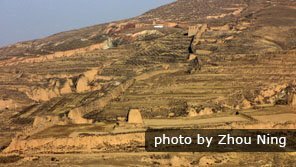 Ancient Yanmen Pass, or Tieguo (铁裹Tiě Guǒ /tyeah gwor/) Pass, is in the former site of Xixing Pass, or Yanmen Pass, an important pass and frontier settlement in northern China. Ancient Yanmen Pass&apos;s Watchtower is at the top of Gouzhu (勾注 Guzhù /goo-joo/) Mountain, outside the Tieguo Pass Fort. Tieguo Pass was dug manually. Its gate is V-shaped, 30 meters wide at the top, three meters wide at the bottom. The fort, about 20 meters wide from the east to the west and approximately 200 meters from the south to the north, was very steep and solid. Four tower foundations exist in the south and one beacon tower in the north. Yanmen Fortress is on the flatland between the eastern and western ridges of Tieguo Pass. Created in the Song Dynasty (960–1127 BC), as a place of strategic importance, it was an important military garrison. The Ancient Road of Gouzhu Pass, is over 30 kilometers long. The current Ancient Road is well-restored. It is paved with stones and stretches with many twists and turns. The cliffs on both of its sides are extremely steep. The Notch was the northern gate of Ancient Yanmen Pass, commonly known as Baicao (白草 Báicǎo / beye- tsaoww/ Notch, was one of the 18 gatehouses of Yanmen. 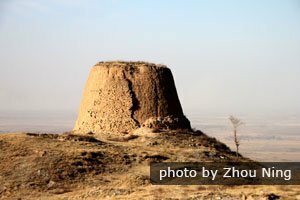 There are two towers in this “notch”: Taihe (太和堡 Tài Hé /teye her/ ) Tower in the south and Changsheng (常胜chángshèng /channg-shnng/)Tower in the north. Between the two towers there were continuous ridges. In the Warring States Period, Baicao Notch was a major thoroughfare from the south to the north. Lots of businessmen and travelers went along the ancient road of Yanmen Pass. The Notch&apos;s towers were built over rivers, with three parallel walls and six gatehouses. They were connected to main Great Wall fortress. One gatehouse and one tower remains. Houling (猴岭 /hoh-ling/ &apos;Monkey Ridge&apos;) was named after the monkey-like stone on its cliffs. 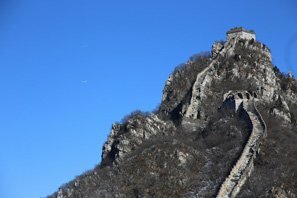 The Great Wall section at Houling was rebuilt in 1605, based on the ancient Great Wall, by Li Jingyuan, a governor in the Ming Dynasty. Its top was paved with three layers of bricks, on which horses can still walk freely. This section is eight to 10 meters tall and 4.6 meters wide. The whole length is over 5,000 meters and there is a flanking tower every 120 meters. Flanking towers were usually built sticking out from the Great Wall. A flanking tower is typically 10 meters wide, eight meters long, and 15 meters tall. Inside the towers, there were places where soldiers could gather ready to charge outside. The tower gates were 2.3 meters tall and 1.7 meters wide. Yanmen Canal is to the east of the ancient road at Gouzhu Pass. It was said that water from the wells in the city contained salt and tasted bitter. It was difficult for people to obtain drinkable water without walking a long way, therefore they dug a canal to channel water from a northern mountain into the fort town, a famous water project in ancient times. The relics still exist. The Ming Dynasty Yanmen Pass, or Dongxing （东陉Dōngxíng /dong- sshing/）Pass, east of Gouzhu Mountain or Xing Ridge. Like Xixing Pass, Dongxing Pass has the same strategic importance. In the Ming Dynasty, Yanmen Pass was extended to cover the area of Dongxing Pass. On both of its sides, the 18 notches of the Song Dynasty were rebuilt. There was a solid gatehouse for each notch. Between notches there were sections of the Great Wall. Thus, with Yanmen Pass Fort as the center, a new military defense system was formed. The fort at Dongxing Pass was built in 1374 by Lu Ting, an official of the Ming Dynasty who was banished to Dai County at that time. 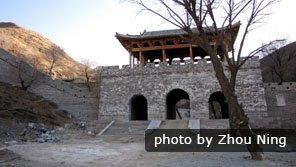 Then it was extended separately by the Jingtai, Zhengde, and Jiajing emperors during the Ming Dynasty, and was rebuilt by the Wanling Emperor (1573－1620), over the following 600 years. 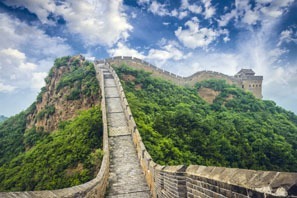 Its circumference is 1,000 meters, and the height of the wall is 10 meters. It is founded on stone and faced with bricks, while its inside is made from rammed earth. There were three gates: the eastern gate, the western gate, and the northern gate. The Barbican is to the north of the fort. The height of its wall is half that of the fort and there are gates in the wall. The gate of the Barbican is commonly called Little Northern Gate. The gate tower of the Barbican was made from bricks and wood. The bailey wall was made of stone, and its circumference was about 10 kilometers. Its southern end was connected to the eastern and the western towers by walls. Its northern end stretched to the bottom of the valley. The main gate of the wall faced north. Ningbian (宁边Níng Biān /ning byen/) Tower, commonly called the Moon Tower, was built on the wall by the Jiajing Emperor (1796－1820) during the Ming Dynasty. Yanmen Pass, Ningwu Pass, and Pian Pass were called the Three Passes. According to historical data, Ningwu Pass, completed in 1467 during the Ming Dynasty, was an important pass of the Great Wall. It was divided into two parts: west and east. Its wall was built along mountains, making it difficult to access. Pian Pass lies on the east bank of the Yellow River in Pianguan County. There are four sections of wall with a total length of several hundred kilometers. About 30 kilometers of the walls are well-preserved. They are spectacularly positioned on the river cliffs. At the beginning of the Warring States Period , Emperor Zhao Wuling defeated the northern nomadic people there. The fortifications were first built in the Huwu period (1368－1398) of the Ming Dynasty. Read more about Pian Pass. The Best Time to GoDai County has a typical temperate continental climate>: dry with hot summers and cold winters. There are big sandstorms in the winter. The annual average temperature is 10°C. Most of the rainfall occurs in the summer and the annual average precipitation is only 540 mm. The best times to visit Yanmen Pass are during the spring and autumn. The nearest airport to Yanmen Pass is Taiyuan Airport (182 kilometers south). There are flights to more than 40 cities. The airport bus to Taiyuan downtown takes one hour. Take a train from Taiyuan to Dai Xian. A trip from Taiyuan East Long-Distance Terminal to Dai County costs about 50 RMB. Then take a bus to Yanmen Pass, costing 30 RMB. 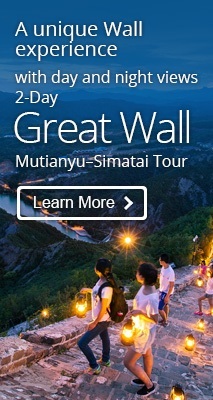 China Highlights specializes in tailor-making China tours. If you want to visit Yanmen Pass, contact us and we can help you avoid any hassles, and have a good Great Wall experience.